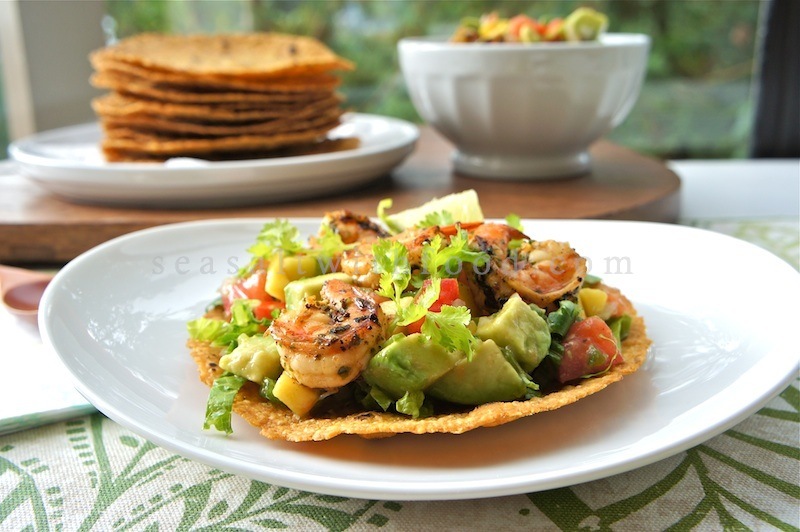 My kids just can’t get enough of these simple and yet, great tasting Prawns And Salsa Tostadas. Delicious and refreshing, a mix of crispy texture with sweet and sour flavors from all the fresh ingredients. 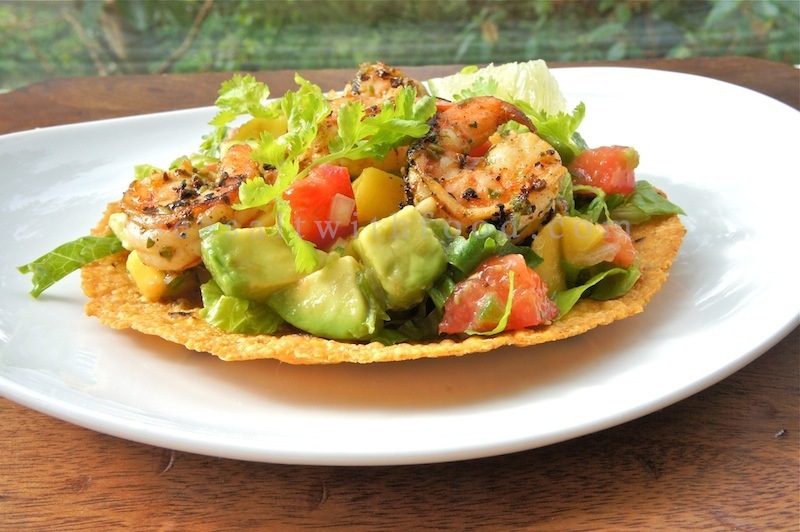 Tostadas are popular savory snacks in Mexico, usually accompanied with salsa, guacamole, or beans. The crispy deep fried tortillas is a great companion with toppings such as grilled meat or seafood, vegetables, salsa, beans, and cheese. Here, I layered my Tostadas with shredded romaine lettuce, a good serving of fresh salsa, and some succulent grilled prawns. Try making it! Combine the chili flakes, lime juice, cumin powder, garlic, coriander, scallions, olive oil, and sea salt. Whisk well and toss in the prawns. Marinate the prawns in the refrigerator for about 1 hour. Grill the prawns over high heat or sauté until they are no longer pink and set aside. Heat just enough oil (about ¾ inch), over medium-high heat. Fry the corn tortillas, one at time and turning once or twice until crisp, about 50 to 60 seconds per tortilla. Shake off any excess oil and drain on paper towels. In a large bowl, combine all the salsa ingredients and mix in the prawns. Season the mixture well with sea salt and additional lime juice if necessary. Refrigerate the salsa mixture until ready to serve. 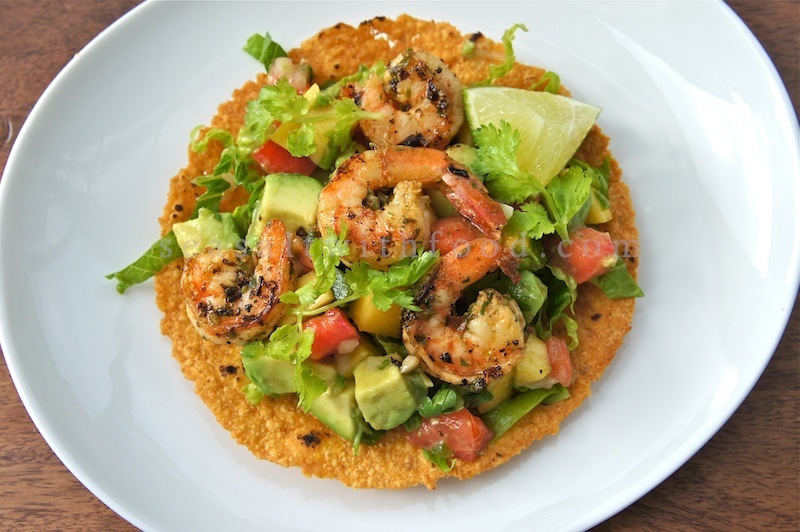 To serve, layer the crisp tortillas with lettuce, then top with the prawns and salsa mixture, lime wedges, and garnish with cilantro sprigs if desired. Serve immediately. This is refreshing - something different for a snack or a light lunch. Love it! I love Mexican food. Love this one. Looks very delicious. I have just learned to make a few dishes. This one will be on my list. what a great dish!! So easy to assemble too! Awesome dish, especially for a fast and easy dinner!